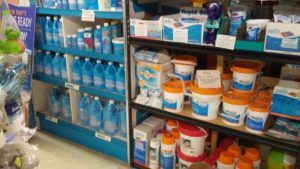 We sell a full line of chemicals from Chlorine, Bromine, or Non-Chlorine to keep your hot tub (or pool) running at optimal performance. We also have a large selection of fun toys for the pool or spas. We provide Baquaspa, and Brilliance, for Spas and Baquacil and Poolife for Pools.